I had to wait a really long time for this tie, as it went out of stock right the same days I decided tu buy it, and it wasn't back before several months. Also, I paid considerably more than expected, as the change EUR/USD has changed pretty much since then (I was buying from Italy). This considered, I hoped for some discount, but unfortunately I couldn't have any. I was rather disappointed about these matters, and I thought I would write quite a bad review. Yet, as you can see, I gave 5/5 to the tie, and this should suggest how satisfied I am of it. I had really high expectations about it: not only I found the tie really great when I saw David Tennant wearing it, but I also read enthusiastic reviews from other customers, both about accuracy and quality. I do not exaggerate when I say that the tie itself goes far beyond what I hoped. I am especially surprised of the how it interacts with light: you will never get an idea of how great it is from pictures - they just don't do it justice. It seems a bit darker than I expected, but this could be due to the light I have here, and the tie is wonderful nevertheless. I also want to point out that I ordered the tie on December 31st, right before midnight in Italy, which means midday of January 1st in New Zealand, and at midnight of the following day, i.e. exactly 24 hours later, I got a mail by Magnoli saying that the tie had been shipped. The only remark I have is that it has been folded for shipment, but I guess this can be fixed easily. 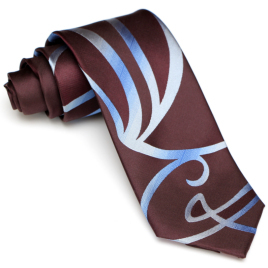 In conclusion, if you want this tie but you are not sure it is worth the money, it definitely is, so buy it now (before it gets out of stock again...!). I must say I haven't really experienced Indy's legendary courtesy, but that might have been about me and my disappointment for the long waiting. I hope I change my mind about this with my next purchase.